Two wuxia movies by the Chinese writer-turned-filmmaker Xu Haofeng: The Sword Identity (2011) and Judge Archer (2012). Xu, who has some reputation as an expert on historical martial arts styles, directs action like nobody else on the planet—as abrupt exchanges between opposing philosophies of movement, choreographed in a careful selection of symmetrical and asymmetrical frames, barely qualifying as violence. His plotting is conceptual and murky, often difficult to grasp. 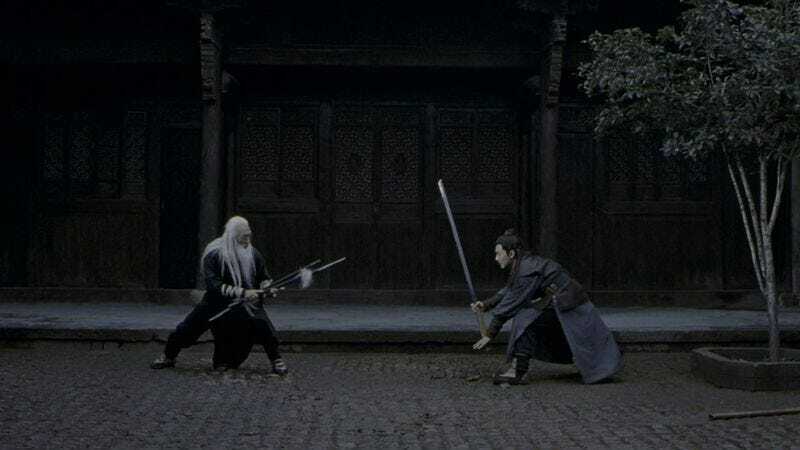 The Sword Identity and Judge Archer (both adapted from Xu’s fiction, as was his more recent The Final Master) involve some transference of identity between parties—martial artists mistaken for pirates in the former, a traumatized young man taking on the mantle of a master in the latter. Their deadpan humor is easier to follow than their narratives. Xu cuts and choreographs his films in addition to writing and directing them. His largely bloodless fights are terse and precise; his discontinuous editing warrants further inquiry. On the opposite end of the spectrum: Born To Win (1972), which I’d been meaning to watch for some time, mostly on account of my fondness for director Ivan Passer’s subsequent Cutter’s Way. Passer is a lesser-known exile of the Czech New Wave. He co-wrote Miloš Forman’s Loves Of A Blonde and The Firemen’s Ball and directed a movie called Intimate Lighting (which is okay) before heading West. His American debut is a largely unsuccessful black comedy about a heroin-addicted ex-hairdresser (George Segal) that never invests all that much in either its scuzzy New York setting or its episodic, bogus plot. But it has it moments, mostly involving the criminal hijinks of Segal’s character and his junkie pal (Jay Fletcher). The cast is good (Karen Black, a pre-Mean Streets Robert De Niro), but the thing is so spotty that the characters just seem to lapse in and out of the movie. A disappointment. Something I wish I’d thought of while writing about John Wick: Chapter 2 is the way the rules of its mythic criminal universe formalize genre clichés. The bad guy and the good guy calling a truce to sit down for a drink—that’s something that’s been done a million times. But in the super-derivative Wick-verse, it’s literally the law; it’s a genre movie where the genre itself is a membership-based institution, and strict adherence to its rules is enforced. These movies, man.